Posted on September 28, 2016 by bhandarimarblegroup CommentsNo Comments on MARBLE DISTRIBUTION, MARBLE MERCHANT, MARBLE MANUFACTUR, MARBLE DEALERS. MARBLE DISTRIBUTION, MARBLE MERCHANT, MARBLE MANUFACTUR, MARBLE DEALERS. Kishangarh is India and Asia’s largest marble market. Everything you thought you knew about marble selection will change. When you journey to the almost endless stock of marble at BHANDARI MARBLE GROUP. •Processing Plants of our company is constructed in the area of more than 6 hectares including Processing Plant for marble tiles and marble slabs.The first plant is the Processing Plant for marble tiles. To utilize small, unshaped blocks from mining operation, our processing plant for marble tiles was constructed. The plant is powered by brand-new and modern imported machines with 2 cutter – sheds, calibration & polishing shed, edge cutting system.as per customer’s requirements. 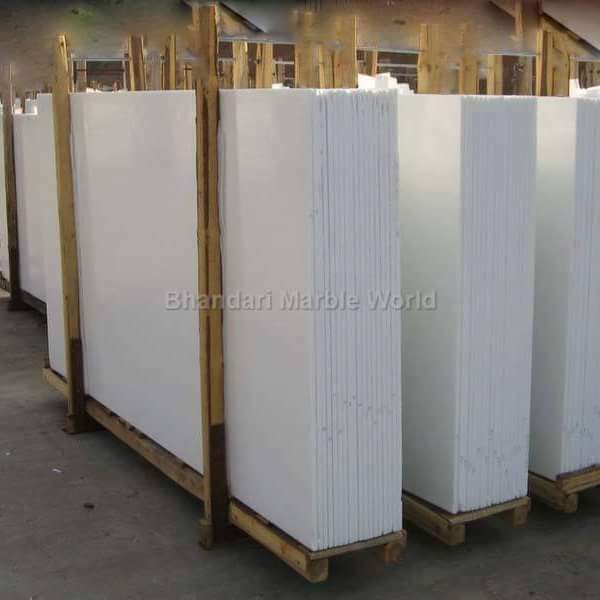 Marble slabs and tiles from BHANDARI MARBLE GROUP is being exported to many countries all over the world such as: U.S.A., Italy, Turkmenistan, Tanzania, Iran, Dubai U.A.E, India, etc. Processing Plant for Slabs is the second one. This plant is well-equipped with newly imported machineries of high technology from Italy equipped with 5 gang saws, 2 polishing lines, 2 dressing machines, 15 block cutters and 6 bridge cutters. The Vietnam quarry has an annual production capacity of 180000 sqm which is estimated to go up to 500000 sqm in the next 3 years.Final products of this plant are polished slabs of various sizes with width ranges from 1m to 2.5m, length ranges from 1m to 3m and thickness as per customers’ requirements. •BHANDARI MARBLE GROUP offers you yet another extraordinary and unique marble- A fine grain marble, the MILKY WHITE hails from our own quarry in village Kothara – Talwara – Raj.The mines is spread over an area of 54 hectare and is equipped with the latest technology machine.MILKY WHITE is known for their fine texture and smooth finish. The hardness, the superlative polish, the luster, the low porosity- every property of the milky white is unique. MILKY WHITE at Banswara is the priceless discovery of BHANDARI MARBLE GROUP and is available in variety of sizes, which will soon dazzle the premium properties, palaces, residential projects, commercial projects etc. •To adorn every space with grandeur, finesse and unmatched quality, staying forever true to the principles this company was founded on.We have consistently brought and will continue to bring the largest volumes of the finest marble to the world by utilizing state-of-the-art technology.Our mantra is to use our expertise to cater to each customer’s needs by offering excellent products and services at competitive prices. The largest range of Indian and imported marble, exclusive varieties from all around the world,very competative prices,several marque projects all over the world adorned by our marble – the most illustrious clientele, and unflinching dedication to customer satisfaction – these are just some of the reasons to select BHANDARI MARBLE GROUP. Kishangarh, Rajasthan is home to BHANDARI MARBLE’S vast processing and experience centre. The widest range of Indian, Italian,Turkish, Spanish and Vietnamese marble is on display at Kishangarh, for customers to pick and choose based on requirement of exclusive variants like Imported Marble, Flawless White & Cat’s Eye, Makrana White, milky white, statuario marble, travertino marble, dark emperador, light emperadore marble, gialio siano marble, red lavante marble, carrara white marble, dyna and Ocean Black who seek a unique identity for their spaces. Be it individual homes or complete townships, the company is equipped to supply marble on demand, based on each cus marble, crema marfil marble, crema florina marble, tomer’s requirements. To experience the quality and scale BHANDARI MARBLE GROUP, plan your visit to Destination Kishangarh today! •A metamorphic rock with outstanding beauty and variety, marble has been an important building material for several millennia. Thanks to the precision of modern technology, marble has become increasingly accessible and affordable for consumers. Improvements in marble manufacturing (marble “fabrication”) include explosives, composite-tipped drills, diamond-studded wire saws, super-fast saws, epoxy sealing and computer-controlled polishing. During the extraction process, massive cube-like pieces of marble are cut out of the ground and transported from the quarry. To minimize the risk of cracks, fissures and other aesthetic damage to the stone, fabricators use a process known at “wire sawing” to gently separate the marble (Figures 1a and 1b). First, two 3-inch wide holes are drilled perpendicularly to each other. Once the holes connect, a heavy-duty wire embedded with artificial diamonds is fed through and secured to a flywheel, forming a loop. A powerful engine applies massive torque to the flywheel, which circulates the diamond-embedded wire at a very fast rate. Since diamond is much harder than the marble, the friction quickly wears it away, leaving a smooth cut plane. After wearing all the way through, another perpendicular hole is drilled and the process is repeated, cutting away the other vertical plane. For the horizontal plane, the wire saw cuts about 80 percent of the marble away, leaving a circle in the center remaining. At this point, the wire is removed and an hydraulic excavator machine forces a wedge into the horizontally-cut planes to break the vertical plane free. Finally, a crane loads the piece onto a truck or rail car for a transport to the fabrication shop. In the fabrication shop, the piece is loaded onto a platform with hydraulic lifts underneath. Above this platform is the “gang saw,” a row of dozens of 10 to 15 feet long steel saw blades connected to a crankshaft via pistons (Figure 2). A giant engine turns the flywheel, which turns the crankshaft and moves the saw blade back and forth horizontally at an incredible rate. Each saw blade is spaced according to the desired thickness of the resulting slabs, usually 3 cm (although 2 cm is fairly common as well). As the blades saw back and forth, the hydraulic lifts push the block up into them, cutting the slabs. Once complete, two workers will gently tilt out each slab, attach a special clamp to it and use a ceiling-mounted winch to lift it into the finishing area. •The slab is laid face down and a machine with a finely-graded, diamond-encrusted abrasive pad grinds down the surface of the slab until it is smooth and vaguely reflective. A worker (or machine, depending on the shop) then sprays on a uniform coat of epoxy sealer onto the surface and leaves it to dry for 48 hours. Heat lamps can expedite this process. Once dry, the slab is flipped over and the process repeated for the opposite side. Polished and sealed, the finished slabs then ship out to retailers and distributors. •At the retailer’s show room, slabs are displayed in giant, iron oxide-coated easels for customers to view. After choosing a slab(s), the customer gives the dimensions of his project (kitchen counters, ballroom floor or bathroom) to the retailer, who maps the shapes onto the slab itself.To cut these pieces out, fabricators traditionally used a process called “wet sawing” where circular saws coated with tungsten carbide cut through the slab while continuous streams of water spray on the blades to keep them from overheating.Today, most fabricators use a technology called “waterjet cutting” to cut pieces, make holes for appliances and create beveled edges. In waterjet cutting, water is pressurized to 60,000 psi and allowed to shoot out in a concentrated stream. Traveling at 2.5 times the speed of sound, the stream mixes mid-air with a powdered abrasive (e.g. aluminum oxide or garnet) before striking the marble (Figure 3). The result is a precise hyper-erosion that can be used for two-dimensional and three-dimensional applications alike. Due to this degree of precision (in the micrometer range), a computer controls the entire cutting process. Has Grown To Become One Of The Largest And Most Trusted Marble Companies In India, Witnessing Over The Years An Incredible Escalation In Its Offerings In Terms Of Quality, Volume And Variety. Though It Had Humble Beginnings That Saw The Birth Of A Superlative Brand Through A Factory At Kishangarh In Rajasthan, Bhandari Marble Has Grown Manifold Over The Years And Is Now Deservingly Proud Of Its Factory That Is Entirely State-Of-The-Art. With Modern Technology, A Capacity To Meet Large Volumes, A Skilled And Efficient Workforce And An Enduring Desire To Surpass Your Expectations While Catering To Your Every Architectural And Interior Need, Bhandari Marble Is Much More Than A Brand. It’s A Promise. A No-Compromise Promise. Welcome to Bhandari Marble Group!!! Thank you for your interest in our Company. Our grandfather Shri Roopchand ji started marble business in 1969. It’s the top quality marble products, value of words and our hard work which made us the leader in Marble Industry. What we do know is the teaching of our grand father – to do businesses by utmost honesty, transparency, dedication and conviction. With this moral ethics as the founding philosophy of Roopchand ji group . This is everything that what we stand for. After so many years our group still holds the guideline and strict quality control and all the teachings of our generations from our grand father. Further group members are constantly evolving in research and development of best quality marble.We try to achieve new goals of development and professional excellence, we endeavour to remain quality quantity of marble business. One Of The Largest Supplier Of Best Quality Indian Marble, Italian Marble, Granite, Sandstone And Other Imported Marbles. We Deal In Indian Marble, Italian Marble, Granite, Italian Marble Companies, Italian Marble Floor Designs, Italian Marble Flooring, Italian Marble Granite, Italian Marble Prices, Italian Marble Silvassa, Italian Marble Slabs, Italian Marble Statues, Italian Marble Suppliers, Italian Marble Tile, Italian Stones, Onyx, Italian White Marble. We are an India based supplier of premium quality marble, granite and sand stone procured from the best and most reliable marble suppliers in the market. We at Bhandari Marble Company boast ourselves as one of the most reputed suppliers and exporters of natural stone from India delivering flawless products suited to the needs of our esteemed clientele. Our elegant and refined collection of Indian and Imported marbles is available in various finishes and provides a tinge of luxury to your home, offices, restaurants and other places. We deal in Indian Marble, Italian marble, granite, companies, Italian marble floor designs, Italian marble flooring, Italian marble granite, Italian marble images, India, Italian marble prices, silvassa, Italian marble slabs, Italian marble statues, Italian marble suppliers, tile, Italian stone, Italian stones, Onyx, Italian tile, Italian white marble etc. We are the largest dealer in Kishangarh, makrana, Jaipur, delhi. Tags : Indian Marble, Italian marble, Italian marble dealer,Italian marble price, Italian marble flooring, statuario marble, statuario marble dealer, kishangarh marble, kishangarh marble dealer, makrana marble, makrana marble dealer, italian marble in delhi, statuario marble in delhi, onyx marble, onyx marble in delhi, marble in kishangarh, companies, Italian marble floor designs, Italian marble flooring, Italian marble granite, Italian marble images, India, Italian marble prices, silvassa, Italian marble slabs, Italian marble statues, Italian marble suppliers, tile, Italian stone, Italian stones, Onyx, Italian tile, Italian white marble etc. We have come a long way since 1969 and our goals have been high on quality, quantity, finishing which is not achieved by any other company. We have broken major records in terms of service and quality hence the true pioneer of marble world. The group in the guideline of shree Roopchand ji Sahab has been regularly involved in social activates helping the needy in the field of medicine, education and educating girl child. Our grandfather always believed in social reforms such as women empowerment, educating girls, fight against dowry and other social evils. Taj Group, Oboroi hotel and resorts, Crown plaza hotel and resort, Karma lake lands, BMW, Hazoori lal jewellers, Vivanta , West inn hotel and resorts, fortune landmark, Hyderabad Rajiv Gandhi international airport, Khanna jewellers, Shangri-la hotel, The leele kempinski, Radisson blue, Emaar mgf, Delhi Indira Gandhi international airport, le meridian, The lobhi, jw Marriott, Hyatt regency, PVR cinemas, Marriott International hotel and resorts, The Lalit, The Shri Ram School, Holiday in Omex, DLF, ITC hotels, JSW steel, Ramada , Suncity , Jindal, Mathoot finance, Amity university, Rajasthali hotel and resort, Clark’s Amber hotel, GS international, Usha Martin, Fortis hospital, Sushaant city, Reliance group, PC jewellers, Hafiz contractor, kingdom of Bahrain(the court of h.r.h.the prime minister), Kumann store chennai, Ttablets india ltd., Torrent pharma, Raka jewellers Pune, Saravan stores Chennai, Vellore institute of technology, Heritage hotel and resort. Welcome To Bhandari Marble Group. We Take Great Pride In Announcing That We Are The Leader In The Marble Industry. We Have Been In This Industry For Last 65 Years And Have Watched This Industry Grow. The Journey Began When Our Grandfather Shree Roopchand Ji Bhandari Laid The Foundation Of Our Group 65 Years Back. Since Then It Was The Dedication, Value Of Words And Customer Satisfaction Of Our Group That Led To Our Becoming The Pioneers Of The Marble Industry. We Have Preserved The Tradition, Ethics And Perseverance Of Our Forefathers And As A Result We Have Been Highly Regarded By Our Esteemed Customers. This Is All Our Group Stand For And Will Continue To Be Known For. Our State Of The Art Facilities, Premium Polishing And Packaging Combined With Strict Quality Control Has Made Us The Number One Choice All Over World. We Have World Class Research Facilities And Innovative Minds Striving Hard To Deliver Cost Effective Solutions. We Welcome You To Be A Part Of Our Grand Journey And See Your Dreams Through Our Eyes. We Have The Largest Range Of Indian And Imported Marble, Granite Stone With Maximum Experience Of Cutting And Finishing Of Marble Stone. Our Large Processing Units Are Equipped With Cutting Edge Technologies To Bring Maximum Production In Cost Effective Manner. Our Team Includes High Tech Engineers, Supervisors And Project Managers. We Believe In Gauging The Future Market Trends And Bring Out The Latest Designs To You. We Believe In Making Your Dream Projects Come True. We Have Conceptual Designs For Individual House, Complete Township, Big Hotels, Airports, Shopping Malls, IT Centers, Showrooms. We Invite You To Visit Our Facilities At Kishangarh And Get To Know Our Prowess. Our Journey Has Been A Phenomenal One Right From Our Beginning. We Have Repeatedly Achieve High Standards On Quality, Finishing And Services. We Are Proud Of All The Major Records That We Have In This Marble Industry. We Are On Our Path To Become The True Pioneer Of The Marble World. The Seeds Of The Social Activates Had Been Sown Very Early By Our Gregarious Grandfather Shree Roopchand Ji. Since His Time The Group Has Been Active In A Number Of Fields Catering Social Issues By Following The Principles Of Women Empowerment, Educating Girl Child And Abolition Of Any Kind Of Atrocities Again Women. Our Group Has Wholeheartedly Contributed Financially In The Field Of Medicine And Education Considering These To Be The Two Pillars Of Success Of Our Great Nation. We Have World Class Packaging And Polishing Facilities.All Kinds Of Marbles And Granites Available In Various Sizes And Designs.Contact Us For High Quality Italian Marble Or Just View Our Products.We Will Definitely Provid You The Best Marble As Per Your Requirements.For Queries Please Visit Our Frequently Asked Questions Section. Agartala, Bhagalpur, Muzaffarnagar, Bhatpara, Rohtak, Korba, Bhilwara, Muzaffarpur. For More Cities And Contact Areas Please Contact Us. We Are Importer, Exporter And Quarry Owner Based In The Heart Of Marble Kingdom Of Makarana And Kishangarh .Our Team Consist Of Highly Skilled And Motivated Personnel.Each Step Right From Raw Stone To Polished And Finished Product Is Carried Out With Advanced And State Of The Art Machinery.We Believe In Leadership By Example.We Have Both Quality And Quantity In Terms Of Stock Available 24×7. We Have Global Presence In Terms Of Marbles And Granite Through Best Dealer Network Throughout The World.We Have Successfully Delivered Numerous Products.We Continue To Seek New Partners For The Fulfilment Of Their Dreams.We Deliver High Quality Marble Process And Packaging That Brings Smiles To Our Valued Customers.We Will Definitely Help You Achieve Your Dream Projects. We Are Proud To Say That We Are The Most Reputed Name In Marble World With Best Goodwill. Be It Architectural Designs, State Of The Art Facilities We Believe In Delivering Customer Excellence Through Our Large Variety Of Marble And Stones.Explore This Space For More Information About Our Company, Our Portfolio And The Services We Provide.Our Site Is Regularly Updated To Bring To You Latest Designs And Products. headquartered at Kishangarh in the State of Rajasthan, India, is a large scale set up engaged in Business of natural stone, processing and selling. BHANDARI MARBLE GROUP is having world class manufacturing facilities. Since last forty six years the company also exporting varieties of Marble Blocks to all over and after processing the same at BHANDARI MARBLE GROUP processing house selling in the World marble stone and Granite market. That’s why BHANDARI MARBLE GROUP FAMOUS For The pioneer company of marble granite and Natural stone. The pioneer company of marble granite and Natural stone. Bhandari Marble Group one of the leading All Type Indian & Italian Natural Stone & having strong foot hold over all Indian Natural Stone Suppliers, Granite, Granite Plates, Marble, Slate, Wholesaler, distributor, Merchant manufacturer, exporter, supplier company in Kishangarh, Rajasthan India. BHANDARI MARBLE GROUP supplying marble, Granite and Natural Stones to Builders, Architects, Interior designers, Hoteliers, Colonisers, Town planners, contractor, or Marble, Granite and Natural Stones import company, Exporter company. Indian Stone Suppliers, Italian Stone Suppliers, Indian Natural Stone Exporters, Italian Natural Stone Exporters, Indian Stone Manufacturers, Italian Stone Manufacturers, Natural Stone Producers, Italian Natural Stone Producers, Indian Slate Suppliers, Italian Slate Suppliers, Indian Slate Exporters, Italian Slate Exporters, Indian Natural Stone Wholesalers, Italian Marble Wholesalers. We are one of the leading multifaceted Natural Stone Conglomerates in India and engaged in the production of many INDIAN & ITALIAN NATURAL STONES viz. Indian Natural Slate Tiles, Indian Granites, Indian Marble, Indian Limestone, Indian Sandstones, Indian Quartzite Italian Marble, Imported Marble Dealer,Italian Marble, Italian Marble, Italian Marble Dealer, Italian Marble Manufacturer, Marble Dealer, Marble Exporter, Marble Importer, Marble Wholesaler. & Indian Onyx and different HOT SELLING INDIAN & ITALIAN STONE PRODUCTS like natural stone veneers, mosaic tiles, slate roofing tiles etc. Manufacturing, supplying, exporting, Indian Green Marble, Indian White Marble, Indian Black Marble, Indian Pink Marble, Indian Beige Marble, Lady Onyx Pink Marble, Indian Sawar Brown Marble. BHANDARI MARBLE GROUP are producing and exporting and importing Italian Marble, Imported Marble, Indian Marble, Natural stone, Granite, big gang saw size slabs, calibrated and polished, leather finish etc. welcomes you to our Kishangarh, Rajasthan, beautiful varieties of Italian Marble, Imported Marble, Indian Marble Stone, Indian, Rajasthan Kishangarh, Marble Granite and Natural Stone oldest and biggest Manufacturer, Suppliers, and Exporter Marble, Granite and Natural Stones, sand stone, quartz stone, slate tiles, Semiprecious stones, Precious stones Marble Handicraft. BHANDARI MARBLE GROUP’S marble Granite and stones are perfectly suitable for Home Villa, Hotels, Malls, Towers, Township, Elevation, flooring, Decoration, wall cladding, bathroom vanity tops, kitchen counter tops. supply premium quality granite, granite slabs, granite tiles, granite floor tiles, granite kitchen tops, granite counter tops, granite work tops, marble, marble slabs, marble tiles, marble work tops, quartzite slabs, sandstone slabs and sandstone tiles, slate tiles, now we are better known as the masters of granite wholesalers, granite processors granite exporters, granite slabs exporters, granite flooring tiles exporters, green marble exporters, lady onyx marble exporters, slate tiles exporters, natural stone exporters and project contractors wherever you may be. has achieved a remarkable mile stone in export of Black Granite Slabs, Black granite tiles, monumental Black Granite slab, Black granite counter tops, Black granite work tops. All over the world Bhandari Marble Group is better known as the best indian granite manufacturer, best indian granite exporter and best indian granite slabs supplier from India. We also offer tiles & slabs of different kinds of Granite, Rain Forest Marble, Green Marble, Slate Stone Tiles, Sandstone Slabs Tiles, and Quartzite Slabs available in the market with unmatched quality, durability and finish. We assure you the favourable cooperative terms, loyalty, competitive prices. Please contact us for Granites, Marble, Slate tiles requirements. BHANDARI MARBLE GROUP’S strong supply base in USA, UK, UAE, Dubai, Doha, Bahrain, European Union, Germany, Russia, France, Netherlands, Italy, Poland, Norway, Australia, Belgium, Canada, Spain, Hong Kong, Singapore, Switzerland, Turkey, Brunei, Japan, Thailand, Indonesia, Barma, Bhutan, Sikkim, China, Shree Lanka, Bangladesh, Brazil, Kenya, Sweden, Malaysia, Kuwait, Denmark, Hungary, Finland, Romania, Ireland, Portugal, South Africa, Ukraine, Greece, Israel, Argentina, Chile, Egypt, Venezuela, Nigeria, Iraq, Bulgaria, Morocco, New Zealand, Peru, Qatar, Tunisia, Lebanon, Netherlands, Jordan, Bahrain, Oman, Cuba, Kenya, Uruguay, Macau, Zambia, Cameroon, Mongolia, Mozambique, Bahamas, Zimbabwe, and Maldives. Made from premium quality stone material, each of our delivered stone products has defect-free finish and is widely used in various prestigious building projects in Australia, Netherlands, USA, Ireland, Germany, Sweden, Israel, Austria, France, Spain, Italy, UK, Cyprus, Belarus, Bulgaria, Costa Rica, Egypt, Guatemala, Mauritius, Mexico, Peru, Ukraine, Romania, Russia, Serbia, South Africa and Turkey. Our business transactions are transparent and hassle free, enhancing the customer experience in the buying process. Empowered with well-defined infrastructure, our experience in handling bulk export order and meeting targets as per the given schedules help us in efficiently meeting customer’s needs at the most economical prices. BHANDARI MARBLE GROUP SUPPLIER, MANUFACTURER, EXPORTER, WHOLESALE, FACTORY OWNER OF MARBLES FROM KISHANGARH, RAJASTHAN, INDIA! Available with us at best market price, these marble stones and Granite are widely appreciated for their beautiful designs fine Cristal, excellent polish, 360 degree finish eye catching colours. BHANDARI MARBLE GROUP marble is processed in accordance to the latest market trends by using hi-tech cutting and polishing tools. Marbleinkishangarh/showroom/ online available. BHANDARI MARBLE GROUP aim to expand our business of marble stone and granite around the world, and become one of the reputed name in the marble stone business. MARBLE and stones are Rainbow color of nature. Strips of Black, White, and many colours looks extremely beautiful on floor as well as wall cladding and decoration. BHANDARI MARBLE GROUP are supplying white and Black marble and many more colour marble granite and natural stones, manufacture slabs and tiles and marble Handicraft. Marble Slabs are available in any thickness any size length and width as per requirement we can customize MARBLE GRANITE AND Natural Stones.